Parents believe they should feed their baby fresh, healthy and organic food. They want to avoid food with extra added sugar and chemicals. By making food at home, parents have the advantage to select ingredients according to their choice of using fresh fruits and vegetables and blend them into a puree. However making a puree can be a hectic and time-consuming process as the ingredients need to be blended properly. In order to cater the need of the parents. Also, Baby immune system is more vulnerable to diseases and they need special care. Normally home blender is used for many purposes from making a smoothie for the daddy to blending other ingredients which leave a weird smell in the blender jar and can change the taste of the food if it is used again to prepare baby food. Various companies have introduced many kinds of baby food makers that are specially designed for the baby and are pretty helpful in making food quickly. Although all the baby food makers have a general purpose which is to blend the ingredients, there are several kinds of brands that are different in size, features, and other things. Parents often get confused in purchasing baby food makers and find it quite difficult to distinguish features among different brands and end up purchasing the wrong one. To make life easy for parents, we decided to put down a list of 5 best baby food makers under $100 in the market. It wasn’t an easy task to distinguish few food makers in the market where several similar products are being offered by many companies and have a little bit of difference from one another. Magic Bullet is well-known in the baby food makers market and is among one of the highly appreciated brands among parents. It has an excellent market reputation for maintaining high standards of quality and safety in all of the products. This baby food maker set has an interesting design with a smiley face on printed in front of cups and bowls which gives it the adorable look. The quality of the whole package is up to the mark and has a high-quality material used in it. The cups and jars of this food makers are made up using high-quality plastic and all the parts of this food maker follow the safety standards. This Baby bullet food maker contains various functional options, you can blend ingredients using baby blend blade or you can mill by using the milling blade and it also has chopping and grinding option. It has a high torque power base which gets the job done quickly. You can easily make the week-long batch in less than 5 minutes, it also a set 6-date dial storage cups which is very helpful for storing the food and remembering the date of the item. Baby bullet package also contains the pocket nutritionist and cookbook which spare you the trouble of crawling through the internet for the guide. The size & capacity of Baby bullet food maker is optimum as it has a product dimension of 12.1 x 10.6 x 9 inches and a capacity of 8 cups which pretty good. The Baby Bullet baby food maker package includes 1 high-torque power base, 1 baby blend blade, 1 milling blade, 3-piece batch bowl, 1 short cup 6-date dial storage cups, spatula, 1 stay fresh resealable lid and tip proof tray, user manual, and recipe book. It also comes with the pocket nutritionist. The price for this baby food maker is around fifty-eight dollars and eighty cents which is reasonable and justified because of the cool options and design it comes with. This food maker also has a good processing speed, its user-friendliness makes it the perfect food maker to get within this price range. So, go and check it out. What are you waiting for? QOOC offers this mini baby food maker with the innovative features and options that are highly useful for multi-purpose usage. The consumers are highly satisfied with this product and are appreciating the product with positive reviews. The design of this mini baby food maker makes it easier for the parents to run it using a single hand only. The operations panel of this product is also very simple as there is only a knob for all the operations, you only have to rotate to set the function. The build quality of this product is high-end and very detailed in every aspect as it meets all the safety requirements. This mini baby food maker has 4-functions, the steaming option lets you steam fruits, meat & vegetables, the reheat and defrost option lets you defrost prepared food and the blending option is the very much the same. The unique controllable nutrients & texture feature lets you preserve the nutrients and also you can adjust the thickness of the purees to whichever consistency you need. This is a mini size baby food maker but it has the good amount of volume capacity. However, the product dimension is 10.3 x 9.3 x 7.8 inches. QOOC is offering this mini baby food maker with a package that includes 1 standard jar and 2 separate sizes jars with 1 spatula. The recipe booklet lets you choose the interesting recipes for the baby foods with the detail instructions. Bapama is a world-renowned brand in baby food maker industry and users are obsessed with this brand as it maintains the quality and offers various features within a single package. This much amount of functions and fast processing speed make this mini baby food maker makes it far better than any normal baby food maker brand in the market. Bapama believes in simplicity when it comes to its design. 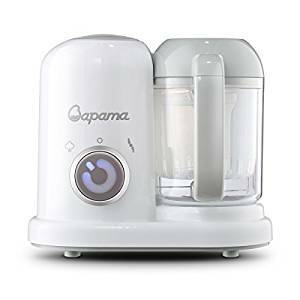 The design of this Bapama mini baby food maker is neat & sleek and has only a circular knob for the operation which means that you can operate the Bapama even when you are holding the child as it requires only a hand to operate. The build quality is so high that you can hardly feel a noise and also the vibration is very low and reasonable. Bapama mini baby food maker has 4 primary functions (steam, blend, heat, and defrost). The interesting feature of this baby food maker is the inching blend option. The inching blend option lets you start the blending of food ingredients even if you put a little amount in the food maker, it gives you the option to operate the food maker in case you forgot to put the batch as small as 1.8oz. Isn’t it a cool feature? The steam heat function of Bapama helps in blending the fibre rich food, by using this option you can preserve useful nutrients. When it comes to choosing the baby food maker, size matters. However, this is a mini baby food maker and still has the mixing cup volume capacity of 12oz. It weighs only 3.3lb and has the total size 9.2″x7.1″x7.9″ only. Well, by purchasing this Bapama mini food maker you get 1 spatula, measure cup, cleaning tool and the all-important baby food recipe. We think that this much stuff in one package is a fair deal. Bapama set this baby food maker mini 4 in 1 with a price of seventy-eight dollars and ninety-five cents. You get the inching blend, nutrient preservation and the super quiet less noisy function in this much price along with options of steaming, blending, heating and defrosting. Wow, a perfect deal. Don`t you think? Hamilton Beach has several products, they are highly specialized in appliances and this 36533 Bebe Baby Food Maker is one of their best product among their baby food makers as they offer cool 4 different feature with an excellent price and their package contain lots of containers and stuff. Normally baby food maker does not come with both shredding and slicing option in this price range but this product is among the best deal you can get. Hamilton doesn’t compromise an inch when it comes to their products quality. They have a market standing and a general perception among consumers that their product is high end and they meet all the necessary safety requirements. This particular product is indeed a high quality and has a simple but nice looking design. The jar handle is specially designed with extra space to create a better grip for the users. Their containers have a design that fits in a box and it also comes with a package. Hamilton`s this baby food maker has the This mini baby food maker contains 4-functional options, the steaming option lets you steam fruits, meat & vegetables, the reheat and defrost option lets you defrost prepared food and the blending option is the very much the same. The unique controllable nutrients & texture feature lets you preserve the nutrients and also you can adjust the thickness of the purees to whichever consistency you need. This Hamilton product comes with the item weight of 6.4 pound and the shredding containers have the volume of 3 oz. 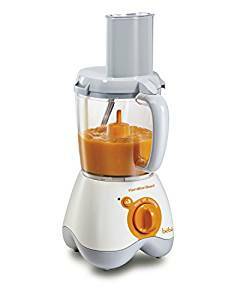 The product dimension of this hamilton beach 36533 bebe baby food maker is 8.8 x 11.8 x 13.1 inches. This Hamilton baby food maker comes with 10 food containers, 5 cup bowl, 3 cup steam basket, a double blade for pureeing and chopping, Reversible disc for slicing and shredding, 2 stackable caddies with 10 separate 3 oz. containers for easy storage, reheating and freezing option. Too many stuff comes along with this baby food maker and it is indeed not common. Hamilton beach 36533 bebe baby food maker has a price of fifty-five dollars and seventy-nine cents only. You must be thinking how can a baby food maker come with this long range of items within a package and for just fifty-five dollars? Well, it is true and you can see for yourself. What are you waiting for? Cuisinart is a famous international baby food maker brand with many different kinds of products, its top of the line product quality can make it the market leader. This compact design of this baby food maker is highly convenient as it can be placed easily in a small kitchen storage cabinet. The jar handle has a smooth shape and has a good grip as you can easily carry the jar full of puree with a single hand. It has a knob instead of too many buttons and is made of high-quality material. 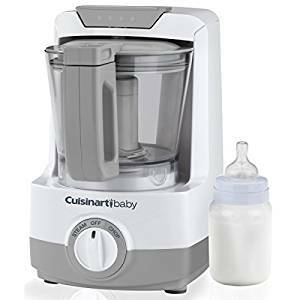 This Cuisinart baby food maker has 3 different functions including the steaming, chopping and the special bottle warmer function which heats the baby’s bottle. It also has a blade lock system which helps in holding the blade in place during the pouring process. The bowl seal is also of a high quality and has the ability to effectively prevent the spitting of the ingredients. Cuisinart BFM-1000GN Baby Food Maker and Bottle Warmer, Green has an item weight of 7.45lb with the product dimension of 10.6 x 6.7 x 12.8 inches. Cuisiniart BFM-1000GM package has a 4-cup bowl, spatula, bottle adapter ring, integrated measuring cup and a useful recipe booklet. The Cuisinart BFM-1000GN Baby Food Maker and Bottle Warmer, Green comes with a price label of eighty-nine dollars and ninety-nine cents. We hope that after reading the above products, parents who think that have to spend lots of money in purchasing the baby food maker because they couldn’t get the proper functioning baby food maker within $ 100 would rethink and consider the option of getting the baby food maker to feed their baby a healthy home-made food. It would be a joke if we say that these are the best baby food makers available in the world and of course we are not saying that because we know that there are several other baby food makers available in the market which are better in many aspects with their high tech feature, extended functions extra capacity but the thing is that after going through the several baby food makers available in the market under $100, we came to these 5 products after filtering many products only because they are better in many ways and possess the best possible level of features and qualities within $100 range. We have also noticed that the trends of baby food maker products sales and purchase to find out that parents are inclining more towards the products that offer multi-purpose functions and those companies who are focusing more on introducing baby food makers with multifunctional options and innovative features are gaining more consumers attention. Also, parent give priority to the products with good storage capacity and all of the 5 products we have listed are the one with reasonable capacity and also they possess good features that a parent normally look for when purchasing a baby food maker.